one eye open, watching me watching. Dry diaper, blue striped shirt. A cup of milk, toasted bread, jam. providing for all our needs? your Thomas & Friends cd. even when you turn away. This is the latest poem in a budding series. Previous poems in the series are: Early ma'ariv in the toddler house, Havdalah in the toddler house, Shabbat in the toddler house. Shacharit means morning prayer. (And ma'ariv is evening prayer, and havdalah is the brief ritual which brings Shabbat to a close.) These are poems about parenting and prayer life. About how I'm trying to maintain an awareness of Jewish sacred time, even when I'm still not able to pray substantive liturgy most of the time. There's much more spaciousness in my life for prayer now than there was when Drew was an infant...though now there are different challenges. Now he notices when I sing, and usually demands that I stop! He pushes boundaries and tests limits all the time, in a perfectly age-appropriate way. My challenge continues to be living with what my teachers would call "prayerful consciousness" -- can I embody the prayers even when I'm not saying them? What would that look like, what would it mean? Becoming a parent continues to impact the way I think about God. I often think about the idea of hester panim -- that God's face may be hidden from us but is always present, always (in the theology to which I ascribe) loving us. Maybe God feels about us as I feel about Drew: sometimes exasperated, but always connected; I may be hidden, but my love for him is always there. Two mother poems in Bluepepper; thanks, Bluepepper! I recently discovered, and subscribed to, an online poetry journal called Bluepepper. Their motto is "Poetry with bite." On my most recent round of poetry submissions, I sent a few poems there -- part of the "mother poems" series I shared here as I wrote one each week during the first year of Drew's life. They're now part of the next manuscript I hope to see in print, which has the working title Waiting to Unfold. To my delight, the editor liked the poems I submitted, and published two of them today: New Poetry by Rachel Barenblat. He chose to publish "Fever" and "Comforter." "Comforter" was written around the time of Shabbat Nachamu -- the Shabbat after Tisha b'Av (our central day of communal mourning), when traditionally we read the haftarah (reading from the Prophets -- in this case, Isaiah) which begins nachamu, nachamu ami (or, in the English familiar to many us thanks to Handel, "Comfort ye, comfort ye, my people.") That poem is filled with references to the Isaiah reading, even as it's also about the experience of struggling with multiple night-wakings in the aftermath of a two-week trip. And "Fever" arose out of the experience of Drew's first summer virus; the opening lines of that poem reference a midrash about Moses, which you can find on this Daughter of Pharaoh: Midrash and Aggadah page, in the section titled "The daughter of Pharaoh raises Moses." Anyway: thanks, Justin, for publishing my poems! I just received in the mail my print copy of Running Tide issue 26 (spring 2012) -- also available online: Running Tide 26 at issuu -- and am enjoying it deeply. As the inside cover notes, "Running Tide offers a voice for faith and practice, as well as critical, existential and socially engaged enquiry within the broad framework of Pureland Buddhism." I'm honored to be able to say that one of my poems, "Without Ceasing," which originally appeared in the Worship issue of Qarrtsiluni (co-edited by Fiona and Kaspa of Writing Our Way Home), is reprinted in this issue of this Buddhist journal. What is Pureland Buddhism? Wikipedia offers an answer, though it's a bit challenging for me to parse; the main thing I take away is that the Pureland practice involves repeating the name of Amitābha Buddha. For a more personal take, I dip into the pages of the journal. Anthony Pilling writes a bit about this in his essay in this issue, which is called "Pureland, Beginners Mind." He describes moving to Malvern, beginning to practice with Fiona and Kaspa's Malvern sangha (community), and grappling with the shift from "just sitting" in silent meditation to what I take to be the more chant-based Pureland practices. (By the by, if you want to know more about Pureland Buddhism, I recommend the What is Pureland? page on the Malvern sangha's website -- clear, comprehensible, and lovely.) Kaspa notes in his Editorial introduction that my poem reminds him of the Pureland practice of calling to Amida. I'm delighted by this area of overlap between my spiritual tradition and his. There's much in this issue which intrigues and moves me. Gregg Krech's essay "Relationship as Spiritual Practice" offers insights into how, when one relinquishes the desire to control or "fix" one's partner, one can relax into a more loving paradigm of relationship. And in "Endings," Caroline Screen meditates on leaving Australia after twelve years and on the very human temptation to soften a goodbye into "see you soon" -- whether it's the goodbye of leaving a place where you have lived, or the goodbye of burying a loved one. Thank you for reprinting the poem, Kaspa! And thank you for introducing me to this journal and to this glimpse of a different set of practices and ideas, both similar to and different from my own. We turn to poems for solace, wisdom, comfort, joy. We wrap ourselves in words -- words of mourning and grief, words of mystery, words of gratitude and remembrance. As unique as each life is, so is each death. And yet, in our isolated grief and mourning, we turn to the comfort, the embrace of the words of others. Some of the poems in this book were known to me before I picked up this anthology -- Jane Kenyon's Let Evening Come (which I just last week resolved to bring to the next shiva minyan I lead), Kay Ryan's Things Shouldn't Be So Hard. And many were unknown to me. All of them move me. Sheila Golburgh Johnson's concrete poem "Yahrzeit" takes the shape of a flickering memorial candle flame. Maxine Kumin's How it is offers up the experience of wearing the blue jacket of an old friend, now gone. Jane Ellen Glasser's "Sharing Grief" opens the experience of two people comparing grief over the phone, "the forms it takes / in the foreign countries / inside us." With its images of unfilled jars and absence, Natasha Trethewy's After Your Death opens the gaping chasm of emptiness. I love the way the Carver poem feels like a shred of conversation, something we enter in medias res, already unfolding. And what more do any of us yearn for than to be beloved? whose skin you cannot penetrate. the lake will hold you up. and death will hold you up. Outside the fall goes on without us. Pastan gives voice here to the complicated longing of watching a parent die. And the poem's final images read both as autumnal description and as a wish for what's coming. If only we could let ourselves go as easily as do the falling leaves -- or, in the Talmud's preferred imagery, as gently as a hair lifted out of a bowl of milk. The "last breath of wind" makes me think of the neshama, the soul-breath which enlivens us; the disappearing place is this life which we enter and then leave. As a clergyperson and pastoral caregiver, and also as a poet and reader of poetry, I am so glad to have this book at hand. My thanks are due to the editors of this collection, for assembling something so poignant and beautiful and profound. Remember the amazing Rumi morning service I attended back in January? I've been beginning to work recently on adapting the liturgy from that service for use at my shul, and am planning a Rumi Shabbat on May 5, about which more anon. Anyway, one of the poems we'll probably use in our Rumi Shabbat service is this one, which draws on the Qur'anic (and Torah) story of Moses leading the Israelites out of Egypt. I wanted to share it here in advance of Pesach, which is coming soon! walked away from to have freedom. and the quietly running streams." Drew and mama on a Friday night. This poem is part of a small but growing series, which includes Early maariv in the toddler house and Havdalah in the toddler house. Pesach is on its way! The first seder will be on Friday, April 6 -- less than two weeks away. And on the second night of Pesach, we begin the process of Counting the Omer, counting each of the 49 days between Pesach and Shavuot, between the festival of our freedom and the celebration of the revelation of Torah at Sinai, between liberation and covenant. During the Omer count, I'll be posting a series of daily Omer teachings on the CBI From the Rabbi blog, which I hope will help enrich and sanctify this special corridor in time. (If you use a blog aggregator or feed reader, you can subscribe to the Omer postings at this feed URL; alternatively, you can choose to receive emails when posts appear on the From the Rabbi blog -- just head over there and click on the "sign me up" button under "Follow blog by email.") But if you'd like some resources for Counting the Omer on your own, here are four of my favorites. Three are newly-published books, and the fourth came out in 2010. It gives me great pleasure to be able to announce the publication of Omer/Teshuvah, a collection of daily Omer poems written by my friend and rabbinic school colleague Shifrah Tobacman, published under the auspices of Omeremo Nanopress. These are meditative reflections intended to enrich one's experience of counting the Omer, marking the 49 days between Pesach and Shavuot, between liberation and revelation. And -- here's the really cool part -- they're also intended to be used during the 49 days between Tisha b'Av and Rosh Hashanah, a seven-week journey Shifrah calls the Omer Teshuvah. If you read the book like an English book, it's an Omer book; if you read it like a Hebrew book, the poems lead you through the Omer Teshuvah. My deep thanks are due to Shifrah for letting me play a role in this process; I hope y'all enjoy her poems, as I do. Trayvon Martin, zichrono livracha / may his memory be a blessing. This is a heartbreaking one. Trayvon Martin was seventeen when he was killed last month by a 28-year-old named George Zimmerman, who most sources are calling a neighborhood watch captain though the National Sheriff's Association has said that he was not associated with an official neighborhood watch. (In case you're wondering, Tablet magazine tells us that George Zimmerman is not Jewish -- ETA: though as one commentor notes, below, they don't actually show that.) Trayvon was unarmed. He was carrying a bag of Skittles candy and a bottle of Arizona Iced Tea. George Zimmerman saw Trayvon walking; he called 911 and reported Martin as "a real suspicious guy," adding, "This guy looks like he's up to no good or he's on drugs or something." Against the protests of the police (who told him not to pursue), Zimmerman chased him, shot him, and killed him. As far as I know, Zimmerman has not been arrested or charged with anything. Because of Florida's "stand your ground law," his claim that he acted in self-defense stands. This despite the fact that recently-released recordings, including Trayvon's last cellphone call with his girlfriend (moments before his death), appear to contradict that self-defense claim. And Trayvon Martin's parents have lost their son. Because he walked through his father's gated community neighborhood (Trayvon lived in Miami, but was visiting his dad in Sanford at the time), and apparently the culture of racism in this country is so deep that simply being a young black man in a hoodie sweatshirt can get you killed. I think I know what white privilege is. White privilege is never being frightened for my son’s life, simply because of the color of his skin. I'm right there with her. I have a son. He's two. He has rosy cheeks and flyaway blond hair. He loves his Thomas train set, playgrounds (in spring and summer), making snowballs (in winter), sitting in my lap while I read Knuffle Bunny or The Going to Bed Book, and going to the bakery on Friday afternoon to get challah and a cookie before Shabbat. I love him so much I don't have words to express it. And I know that because he is white, neither an armed vigilante nor a police officer is likely to shoot him under the mistaken impression that he's a criminal. My heart goes out to Trayvon Martin's parents, and to the parents of every child who is killed because someone's unconscious stereotypes caused them to imagine a threat where none existed. Source of Peace, bring them peace along with all who mourn. Help us to shake off the spiritual ennui, the compassion fatigue, the unknowing racism which allows this to be our nation's status quo. Raise up our anger. Wake us up. Help us change. For Your sake, and for ours. God, full of compassion, grant perfect peace under the wings of Your presence to the soul of Trayvon Martin, who has entered eternity. May he rest in peace. It is humbling to sit by the bedside of someone who is transitioning out of this life. Sometimes their breathing is labored. Sometimes there is the "death rattle," a kind of guttural rasping with each inhalation. Often their skin begins to seem almost translucent. The Hebrew word for skin and the Hebrew word for light are homonyms. Often as I touch their arm, or stroke their forehead, I remember extending that same gentleness to someone who has died. I say, It's Rabbi Rachel. I'm here with you. Your loved ones are here with you. I say, let go of any old stuff, any anger or frustration, any baggage between you and anyone else. You don't need it anymore. I say, we're letting go of our issues with you, too. We love you. Whenever you are ready, you're free to go. I sing the angel song. I think of the illustrations in the bedtime shema book, sweeping watercolors showing Wonder and Strength, Light and Comfort, the angels who accompany each of us into sleep. I sing the niggun which asks why a soul incarnates in this world, and which answers that we enter this world in order to know God. A funny thing, isn't it? We think of God as being beyond this world, and yet the way to know God is to be in the world. We have to be apart in order to yearn to be together. When we leave this world, maybe we return to that intimate connection. I believe we do. May angels accompany you, dear one, through this passage into what's coming. We love you. We're here. You are not alone. Here's a question I've been asked but have never known how to answer: is there a blessing for menstruation? I've been thinking a lot lately about the ways in which American culture teaches women to have negative feelings about our bodies. One of the subtle ways in which this happens, I think, is in the shame we're taught to feel about even mentioning menstruation, much less experiencing it. People generally don't talk about menses in polite company. And when we do, we use euphemisms. (When I was a teenager, people said "on the rag." I'm not wild about that term, though it's slightly better than the curse. )The point, though, is that it's not a curse. Each month when my uterus sheds its lining, that's a sign that new life isn't growing in my womb this time around, but that doesn't change the reality that my body can be a home for new life, and that's incredible. There are times when menstruation can be a heartbreak. For women (and their partners) who struggle with infertility or experience miscarriage, who yearn for a pregnancy, the monthly return of bleeding can be a source of tremendous sorrow. I remember the first few periods after my miscarriage. The bleeding and the cramping reminded me of that awful morning in Colorado when I had woken to discover my pregnancy over. I don't want to gloss over that. But that doesn't make the bleeding itself wrong, or gross, or something to be ashamed of. This is something which cis-gendered women -- half of the human population! -- experience every month from puberty until menopause, except when we're pregnant (and, for some women, during the early months of nursing). Our wombs grow the stuff they would need to support a fertilized egg, and then when no egg implants, our wombs naturally let that stuff go. This is a natural part of life, no more "gross" than birth or death -- both of which, granted, may be scary, but to my mind anything which connects us with birth and death is by definition holy. Watching these debates unfold, I find myself wondering whether the world might be a better place if we celebrated women's bodies instead of allowing ourselves to be made ashamed. Blessed are You, Adonai our God, Ruler of the Universe, who has made me a woman. In a traditional Orthodox prayerbook, as part of the series of morning blessings recited each day, men are instructed to thank God for not making them women, and women are instructed to thank God for making us according to His will. In most liberal siddurim, we find instead a single blessing -- intended to be recited by people of all genders -- which thanks God for making us in the divine image. But I love Rabbi Goldstein's idea of sanctifying menstruation by actively thanking God for making me a woman, using this twist on these very traditional words. I make the asher yatzar blessing when I go to the bathroom. If I can aspire to sanctify even that act, surely I should aspire to sanctify my body's potential to nurture new life -- and my body's ability to let that potential go. If you're interested in this subject, don't miss Kohenet director Taya Holly Shere's writing on sacralizing menstruation, which is excerpted in Jay Michaelson's book God In Your Body. I just finished The Hour of Sunlight: One Palestinian's Journey from Prisoner to Peacemaker by Sami Al Jundi and Jen Marlowe. I picked the book up on Emily Hauser's recommendation, and I'm so glad I did. As a teenager in Palestine, Sami al Jundi had one ambition: overthrowing Israeli occupation. With two friends, he began to build a bomb to use against the police. But when it exploded prematurely, killing one of his friends, al Jundi was caught and sentenced to ten years in prison. It was in an Israeli jail that his unlikely transformation began. Al Jundi was welcomed into a highly organized, democratic community of political prisoners who required that members of their cell read, engage in political discourse on topics ranging from global revolutions to the precepts of nonviolent protest and revolution. Al Jundi left prison still determined to fight for his people’s rights—but with a very different notion of how to undertake that struggle. He cofounded the Middle East program of Seeds of Peace Center for Coexistence, which brings together Palestinian and Israeli youth. Marked by honesty and compassion for Palestinians and Israelis alike, The Hour of Sunlight illuminates the Palestinian experience through the story of one man’s struggle for peace. This book wasn't always easy for me to read, but it is powerful and it is worth reading, especially for anyone who (like me) may have more access to Israeli narratives about the Middle East than to Palestinian ones. If you were reading this blog back in 2008, you caught glimpses of the summer I spent living in Jerusalem. While I was there, I shared an apartment with my dear friend Yafa, her husband Harley, and their daughter Ariel, who was then three and a half. Yafa and I were ordained together last year. (Here's an article about her from what was then her local newspaper: For Rabbi Yafa Chase, all signs lead to service.) Since then, she and her family have spent several months in Ethiopia -- where she has lived and worked before -- following the vision and the intuition which told her that there was a son waiting for them there. For now they're back in the States -- they returned for Yafa's mom's funeral -- but they have fallen in love with a little boy named Samuel, and hope to bring him home soon. Meanwhile, they want to do something to give back to the community of orphan children there. Enter Buy a Tallit, Help Orphans in Ethiopia. On that website you can read their story in Rabbi Yafa's own words; you can see images of the Ethiopian-loomed tallitot (woven by a collective of weavers in Gondar) which are for sale; and you can either buy one for yourself or as a gift, or simply make a donation. Please consider helping my friends do something kind for children in need. Norouz is the Persian new year, which is happening right now. (I've blogged about it before, a little bit.) The above image reads "Norouz Sameach" -- "Happy Norouz" in Hebrew. I found the image in a post at Israel Loves Iran (which in turn I found via a post at Mystical Politics). If you have a few minutes to spare, I recommend browsing the gallery of images at Israel Loves Iran. All of them were submitted by Israelis who want to send the message that they feel only warmth and kindness toward Iran and that though the Israeli government is pretty belligerent toward Iran these days, it doesn't represent everyone in Israel. The image campaign was started by Ronny Edri and Michal Tamir; while the original flurry of images came from Israelis (for Iranians), Iranians are now responding in kind. Pretty cool. Anyway. To those who are celebrating Norouz, happy new year! May the coming year be sweet. This week we're entering the book of Vayikra, known in English as Leviticus. A lot of people cringe a little when we reach this part of the Torah: so many details of sacrificial offerings, this part of Torah may feel distant from us. But in one traditional paradigm, this book of Torah is what's taught first when we begin teaching Torah to our children. It's (quite literally) central to Torah -- book 3 of 5, this one is in the very middle. And there's some wonderful stuff here. If you're looking for more context, I can recommend Leviticus at My Jewish Learning, an essay by Baruch Levine which offers a good overview of this book of Torah. And, for a different take on the parsha, I recommend Reb Jeff's weekly Torah post this week -- Vayikra: The Joy of Contrition. 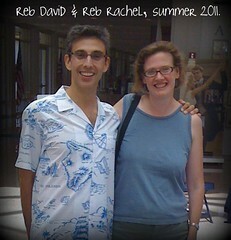 With David, last summer at the 2011 ALEPH Kallah. What a treat this past Shabbat turned out to be! My dear friend Reb David came to visit, and together we led davenen (prayer) at my shul. We'd realized, early on, that Saturday was going to be St. Patrick's Day, and we wanted to mark that in some way. "We should set a piece of liturgy to the tune of something Irish," I emailed him. "What Irish melodies do we know?" A few hours later, I got an email in return featuring an mp3 of David singing "Mi Chamocha" to the tune of "O Danny Boy." I laughed. And then I wrote back promising him that we would do it, for sure. When else in my life was I likely to get that opportunity? As it happened, we had special visitors this weekend: a handful of folks from the Greenfield shul up the road. Between their added energy, and the assembled folks from my community, we had quite a little crowd! This week's Torah portion was the very end of the book of Exodus. As soon as it was over, we broke into song -- the melody for "Chazak chazak v'nitchazek" which we'd taught earlier in the morning. David offered a d'var Torah which explored the question of what it might mean that at the end of Exodus the entire community of Israel sees the fire and the cloud, together. And then after our oneg (which featured not one but two beautiful small birthday cakes! ), a handful of folks stayed to learn a Kedushat Levi text, which led us into a conversation about how when we enter into Shabbat wholly, we heal the workweek. This Shabbat felt restorative. 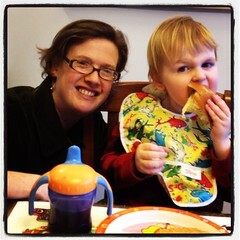 As a working rabbi, as a working mother, I've found that Shabbat doesn't always feel like the oasis in holy time that I want it to be. But this week I glimpsed that. I'm grateful. In honor of Pesach being just around the corner, I wanted to share a few Pesach melodies. Specifically, here are three different melodies one can use for singing the order of the seder. You probably know already that the word "seder" means order, from the Hebrew לסדר / l'sader, "to arrange." And there's a set order to the proceedings: fifteen steps from beginning to end. Why fifteen? Fifteen were the steps up to the Temple, once upon a time, which were understood to correspond to 15 songs of ascent found in psalms. The Hebrew number fifteen can be spelled either as ט''ו / 9+6 or as י''ה / 10+5 -- and that latter spelling also spells "Yah," a name of God. The folks at Aish.com note that "The Sages say that Passover occurs on the 15th of Nissan (the Jewish month), to teach us that just as the moon waxes for 15 days, so too our growth must be in 15 gradual steps. Think of these as 15 pieces of the Passover puzzle." To me, the fifteen steps of the seder are like gates through which we pass on the evening's spiritual journey: from kadesh, kicking things off by reciting the kiddush and thereby sanctifying time, all the way to nirtzah, the seder's conclusion. In recent years I've borrowed a custom I learned from Hazzan Jack Kessler and Rabbi Marcia Prager at the seder they led at Elat Chayyim some years ago. In my seder, as we reach each of these gates, we sing through the 15 steps (start to finish), and then sing the melody again, as far as whererever we are on the journey. So the first time we do it, we sing all fifteen steps, and then just sing the first one. The second time, it's all fifteen and then the first two. Then all fifteen and the first three. And so on. It can be hard to remember to stop singing, especially as the evening's four glasses of wine are consumed, so hilarity sometimes ensues! People have graciously said some very kind things about my haggadah: "I was blown away by the insights and freshness that I found in your haggadah" (Tony) and "I am in the process of converting, and I have struggled to find a haggadah that reflects not only my Judaism, but my feminism and my politics. This is finally one that I can share with my family as I lead my own seder for the first time. Thank you for offering the world this method of telling the story of our freedom" (Natalie) and "I used your haggadah as my foundation for leading the second seder for my family... They told me afterwards it was the most meaningful seder they had ever attended -- actually they told me it was the FIRST meaningful seder they had ever attended" (Rhonda.) I hope that if you use it, it helps you connect with Pesach in deep and meaningful ways. I've been putting a lot of energy lately into preparing for what comes after Pesach: the Counting of the Omer. For years I've toyed with the idea of trying to post something -- a thought, a teaching, a blessing -- relating to each day of the Omer count. Now that I'm blessed to serve as a congregational rabbi, I found my desire to make the Omer meaningful for people (maybe especially people who don't usually think in terms of counting the Omer each night during that holy seven-week span) even stronger. So I seized that desire and ran with it. This year I'm actually going to manage it, and I'll be sharing those daily postings at the From the Rabbi blog which I maintain for my shul. The trick, I've realized, is to queue up the postings before the Omer begins, so that once we're in the Omer count, I can let each day's unique combination of divine qualities wash over me instead of fretting about whether or not I've posted anything today. I've been working on these for weeks, and they're finally complete. I'm looking forward to the first post going live, on the evening of the first full day of Pesach, as we approach sundown and prepare to begin Counting the Omer. Anyway, I'll post more about those here soon, including instructions on how to subscribe just to the Omer posts on that blog. What else can I tell you? It's an overcast morning here, cool and grey. Purim already feels a long way distant. Pesach approaches, inexorably. Spring is on the way. I received an email recently from one of the people involved with planning Holy Week services at the National Cathedral. Apparently the Rev. Canon Mary Sulerud wanted to gain permission to use one of my Torah poems -- Naked / Acharei Mot, originally published here at Velveteen Rabbi when I was writing weekly Torah poems (and now published in 70 faces) -- in the liturgy on Monday, April 2 of this year. I wrote back immediately with a delighted yes, of course. I don't think my work has ever been read in the National Cathedral before; what an honor! The service will apparently be webcast as well. If you're observing Holy Week and you're looking for a service in DC on Holy Monday (or if you live elsewhere but are looking for a service broadcast online), and if the notion of hearing Jewish Torah poetry as part of Holy Week experience sounds potentially meaningful, perhaps this is the one for you. Thank you, Rev. Canon Sulerud; I wish you and yours a blessed journey through Lent. My essay "On Poetry and Prayer" is in CrossCurrents! The cover of the latest issue of CrossCurrents. I'm utterly delighted to be able to announce that I have an essay in the new issue of CrossCurrents, a magazine which collects (in its own words) "the best thought and writing on religion and the world," published on behalf of the Association for Religion and Intellectual Life. Here's the table of contents for Volume 62, Issue 1, the March 2012 issue. There's an essay by Catherine Madsen called "A Heart of Flesh: Beyond 'Creative Liturgy,'" and there are four other essays written in response to hers. That set of thematically related essays is the heart of the issue, though the theme of liturgy and creativity is also carried-forth into other parts of the journal. In the general articles section there's a piece by Eric Selinger called "Law as Lyric, Lyric as Star Trek: A reading of Kol Nidre" (which is, yep, right up my alley, as you might imagine), and two essays on the general theme of poetry and prayer: Edward Feld's "Poetry and Prayer," and my "On Poetry and Prayer." And much, much more. I'm honored to be in this excellent company. As an "abstract," the journal has published the first page of my article for general readership. Alas, the full text of the articles (all of them, mine included) is only available to subscribers; here's subscription information for individuals and institutions, or you might check your local library or university library to see if they have a subscription or online access there. Anyway: thanks, CrossCurrents editors!